Your spirit animal ? Name one animal/insect that represents your character or self. 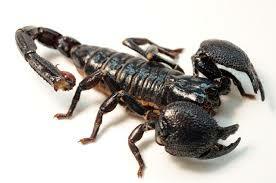 My spirit animal is a scorpion, they sting you if you mess it to much and are fast. They are also my zodiac symbol. I also made a club about scorpions. RXR. : Is there a way we can find out our spirit animal? RXR. : The first one thinks I'm a dolphin. Can I also just take a moment to acknowledge @RXR. putting something in the correct thread for once. admin: You know that RXR fled from the wrath of max at DDO, right? Tejretics: Yip, been told that countless times. Even by RXR themselves haha... I do wish sometimes that DDO drama didn't spill over to edeb8 and people stopped caring what max at DDO thinks while on edeb8, at least after a while. Tejretics: Lol, who doesn't love edeb8's lack of drama? My scorpion is better than your dolphin.